A previously well 30-year-old woman re-presented to the emergency department complaining of worsening central abdominal pain initially colicky at first presentation 2 days earlier. She was tachycardic at 105 and other vital signs were normal. Her abdomen was peritonitic. At initial presentation, she was thought to have biliary colic, even though ultrasound and hepatobiliary iminodiacetic acid scans were normal. She did not have plain abdominal films. Laboratory studies were normal. 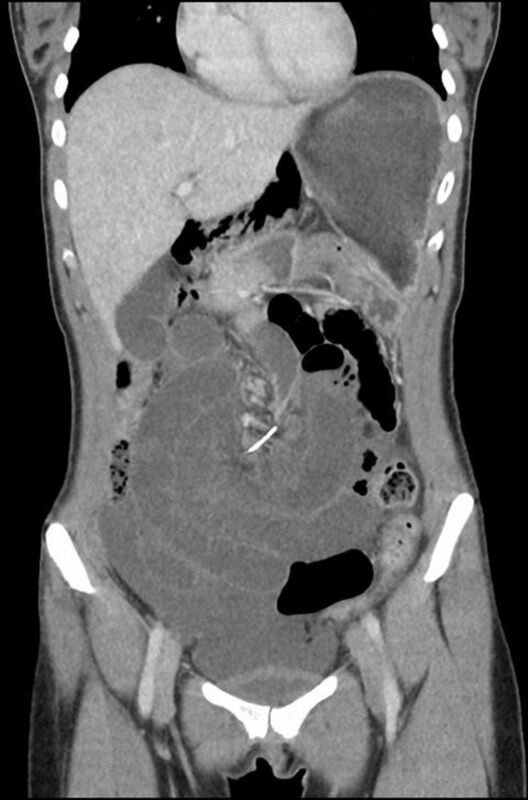 CT of the abdomen revealed a metallic wire-shaped foreign body at the mesenteric root of a small bowel volvulus (figure 1). The patient underwent an emergency laparotomy which discovered mid–small bowel ischaemia from a band adhesion related to the perforation of a 7 cm piece of orthodontic wire (figure 2). 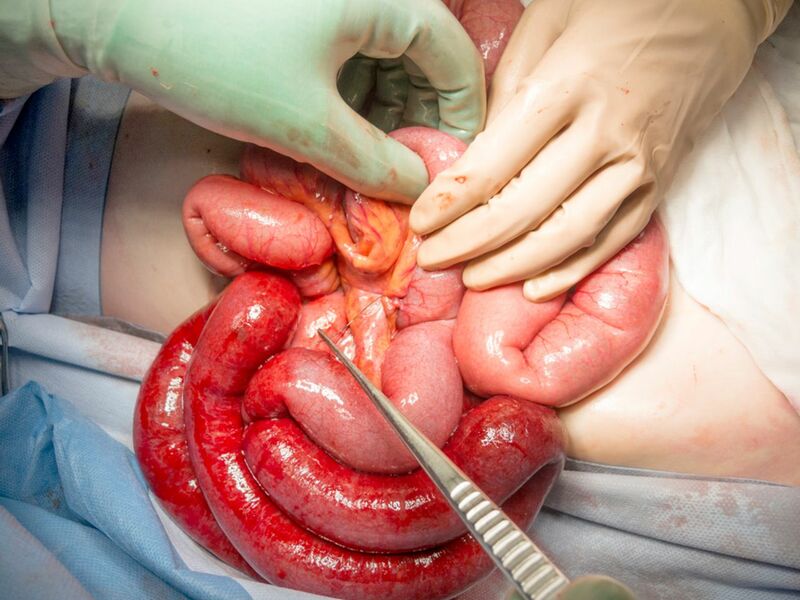 The wire penetrated through the small bowel and the small bowel mesentery and to another loop of the mid–small bowel. This had formed an axis around which the volvulus developed. Adhesiolysis was performed but no bowel resected. The patient had not worn orthodontic braces for 10 years and did not recall ingesting the wire or having her braces wire go missing. CT image (coronal) of orthodontic wire at the root of the small bowel volvulus. Intraoperative photograph of the orthodontic wire embedded in the small bowel mesentery after the ischaemic bowel was released. Most inert ingested objects, if they pass the cricopharyngeal sphincter, will pass spontaneously.1 The most common site for perforation or obstruction is the ileocaecal valve.1 The case we describe here is therefore novel in the decade delay in presentation and the clinical sequelae. Foreign body ingestion should be considered as a cause of abdominal pain in patients with no other medical or surgical history. Routine plain film of the abdomen is a useful initial investigation and should not be overlooked. Contributors TS: wrote the article. AT and RN-M: contributed to the editing process.